We finally started getting some Spring weather here and I have been tweaking Delta Version 2. Although it may look similar to Version 1 there are some considerable differences. Significantly, I didn’t make nearly as many mistakes as the first build. It’s lucky I don’t know what I am doing as I wouldn’t be so open to trying new ideas. 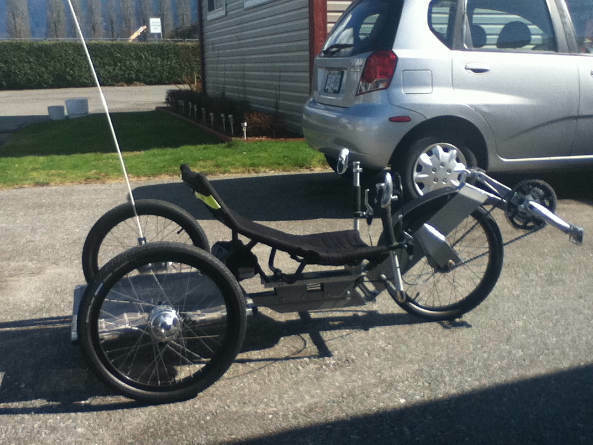 Despite the best advice & intentions of others telling me, “that won’t work,” or “you can’t do that,” for the most part the trike is a huge improvement over the first build. I still have a few wrinkles to sort out though. A key difference between this & Delta 1 is the size & weight. 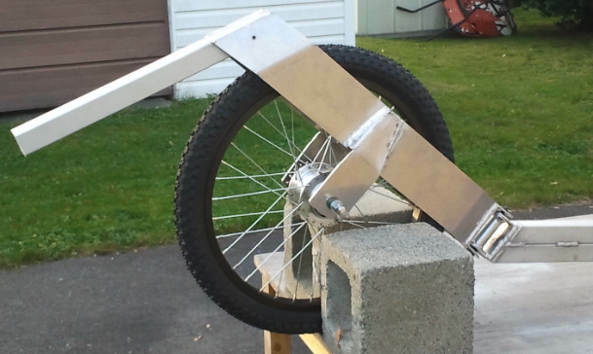 On D1 I used industrial strength square aluminum tubing & it rode like a truck! Rock Hard! You could feel each & every imperfection in the road. 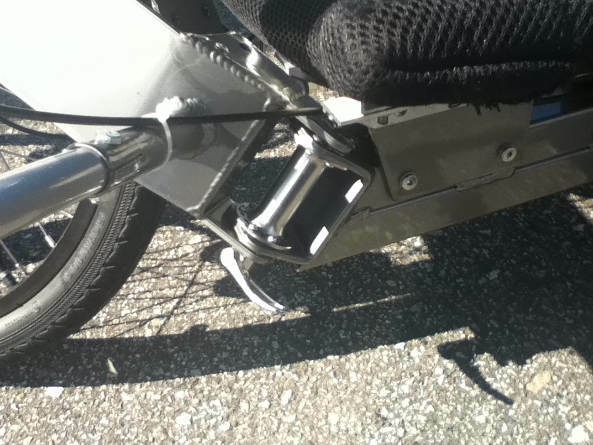 It also steered like a truck – very heavy steering & the rim brakes were not up to the job at all. 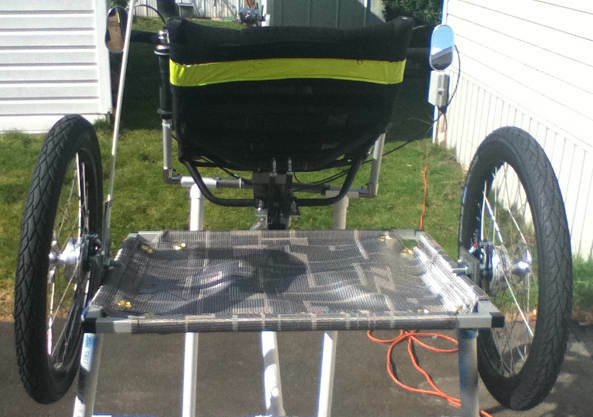 On D2 I used a lighter weight aluminum & it has made a huge difference in the ride. It is also about 4 inches shorter than D1. I suspect the frame is flexing as the ride feels suspended now which may be a problem down the road if the frame is flexing too much. One problem that still persists is the Pedal Steer – with each turn of the pedals the front wants to turn away from the pedal stroke. I am hoping the application of steering strut dampers will help this. 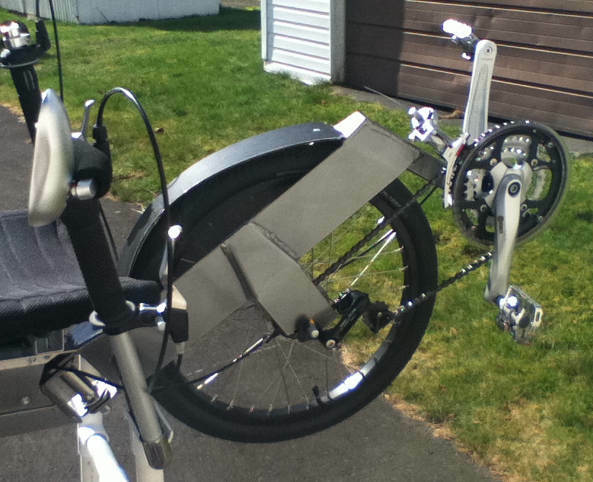 I was also able to get my Shimano Nexus 8 speed IGH to work with the front dérailleur to give me a total of 24 speeds. I was expecting to only get the middle & 48 tooth chain ring. 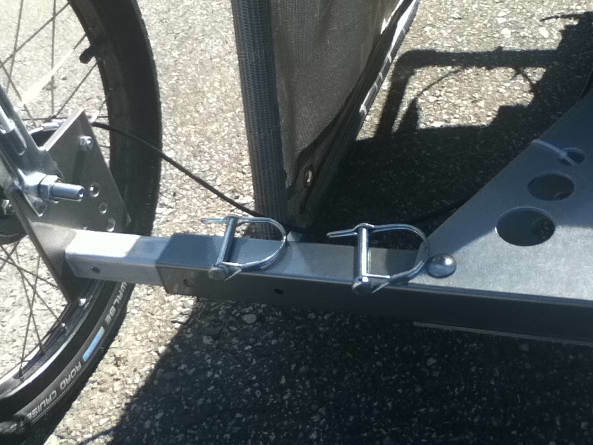 Unfortunately, the chain tensioner sticks out too far & is subject to heel strikes. I think I will do away with the front dérailleur, shifter & chain tensioner as I am a big believer in keeping things simple and the Nexus 8 speed is a fine reliable unit on it’s own & I really don’t need to go 30 or 40 mph. 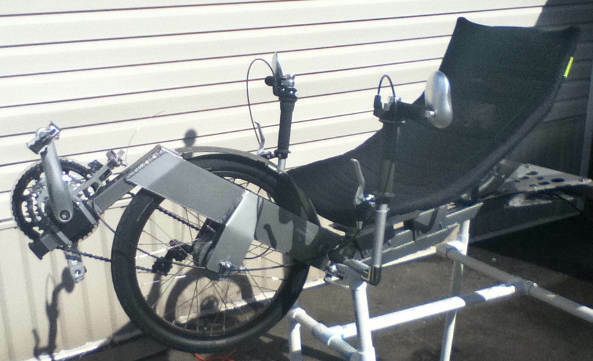 I may go for a hard shell seat as I think some of the pedal steer is due to moving my bum when I pedal. 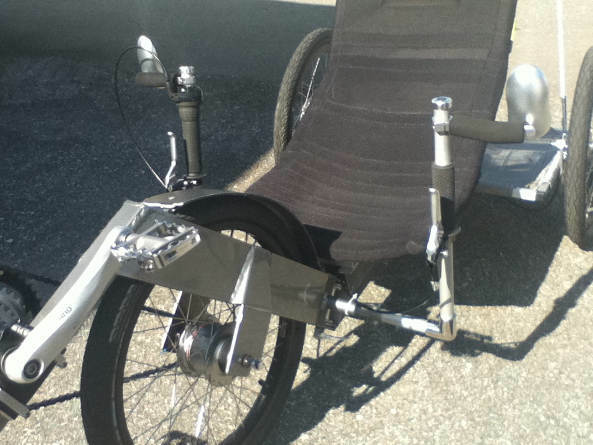 A hard shell seat might offer more stability. Seat of the pants testing would put the total weight around 37 pounds, as it feels considerably lighter than my Trident Stowaway 11 I had in 2011. Next chance I get I will get it on a scale. Center of gravity is nice & low along with the package shelf on the back. 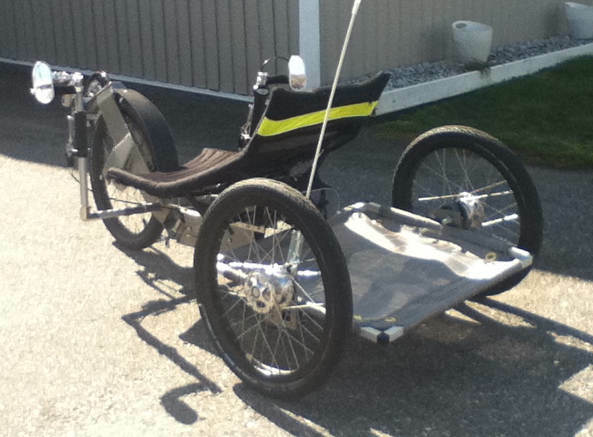 Majority of the weight is over the front wheel where you need it on a front wheel drive, so much so that I had to redesign my trike stand to not twist itself while the trike was up on the stand. Weight (via bathroom scale) – 44lbs. Glen is the man in yellow.